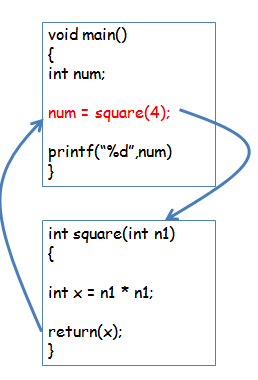 How Function works in C Programming? C programming is modular programming language. We must divide C program in the different modules in order to create more readable, eye catching ,effective, optimized code. In this article we are going to see how function is C programming works ? Explanation : How function works in C Programming ? Firstly Operating System will call our main function. We have called a function square(4). [ See : How to call a function ? ]. We have passed “4” as parameter to function. Note : Calling a function halts execution of the current function , it will execute called function , after execution control returned back to the calling function. Returned value will be copied into variable. Whenever we are inside called function we loose control on the data declared in the previous function. If we have to perform certain operations on the data then we pass a xerox copy of the data to the called function so that called function can perform certain operations on the data and will return us a result. The original copy of the data is called as “Actual Parameter / Actual argument“. The Xerox copy of the data is called as “Formal Parameter / Formal Argument“. Any operations , any extortion made inside formal argument will not modify actual copy of the data.